The Richmond SPCA, founded in 1891, is a no-kill humane organization dedicated to the principle that every life is precious. The organization saves the lives of more than 3,000 homeless animals each year and cares for approximately 350 cats and dogs daily. 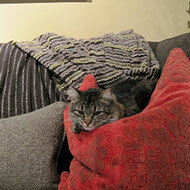 The Richmond SPCA is not affiliated with any other private animal welfare organization or SPCA but has transfer relationships with several area city and county shelters, whereby it transfers animals from the municipal shelter to its own Robins-Starr Humane Center to be placed up for adoption. The Richmond SPCA operates a free and low-cost spay/neuter clinic, the full-service Clinic for Compassionate Care, a free behavior helpline and offers pet behavior classes, children’s educational services and numerous volunteer programs. Journey 4 A Cure is a Pediatric Cancer foundation committed to funding research, increasing awareness of pediatric cancer and enhancing the lives of children battling cancer. One of the ways in which they do this is by providing iPads to children undergoing cancer treatments. The goal of iPad program is to offer a tool that will allow children to communicate with friends and family outside of the hospital, utilize built-in apps to stimulate their learning and keep them on grade level, and, most importantly, have FUN! It is their hope that the simple gift of an iPad will provide some happiness to a child who has had their childhood experience compromised by this disease. The Rescue Mission provides a safety net of comprehensive care for the homeless, the hungry, the chemically addicted, the impoverished and the hopeless in SW Virginia. 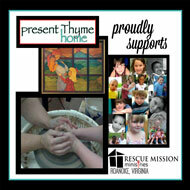 Present Thyme has gladly supported the Rescue Mission for over 20 years. Founded in 1981 SPARC (School for the Performing Arts in the Richmond Community) inspires young people to reach their full potential through quality training in the performing arts. SPARC develops life skills among young performers, preparing them for productive lives and leadership. The Navy SEAL Foundation provides immediate and ongoing support and assistance to the Naval Special Warfare Community and its families. Established to serve U.S. Navy SEALs, Special Warfare Combatant-craft Crewmen, Naval Special Warfare (NSW) support personnel, and their families, the Navy SEAL Foundation provides a comprehensive set of programs specifically designed to reduce the stressors associated with the tremendous amount of uncertainty and pressure that comes with life in Naval Special Warfare (NSW).